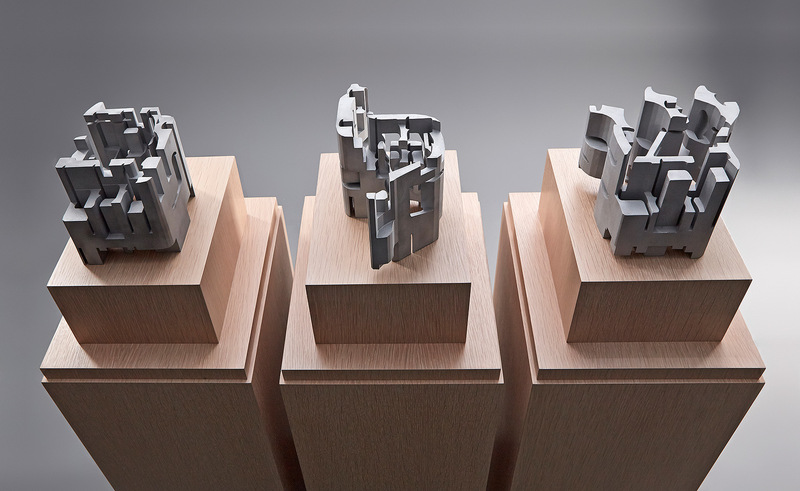 Commemorating the 500th anniversary of the Jewish Ghetto in Venice, Shalem/Chasser employs Hebrew text—the universal element that unites the Jewish people—creating a three-dimensional sculpture, engaging form and content to evoke both the historical significance of the Jews in Venice and an existential lens on the perception of our existence. Mirroring the social concept of individuals as part of a collective existence, the piece consists of three separate letters in cast aluminum that form a single word: Shalem, “whole/complete” in Hebrew. Within the three letters the word Chasser (“hole/void” in Hebrew) is carved. Encapsulating a "void" within the "complete" invokes the geographic segregation of the Jewish Ghetto within Venice, as well as the integral space Jews inhabited within Venetian society. Ranging from doctors and moneylenders, Jewish people were simultaneously separate from and integrated into the cityscape of Venice. This duality of separation/integration, inspired by a specific historical event 500 years ago, resonates equally in a metaphysical exploration of our present-day reality. Do we only see the hole (what is lacking) when we survey our existence, or will we recognize that which is lacking is an essential part of our larger existence? And while we may perceive ourselves as separated by any number of characteristics—be it language, belief system, geography or ethnicity—ultimately there is an expansive vitality which springs from intercultural co-existence.